What kind of moment asks for a monument? The Freedom Tower, the Vietnam War Memorial, the Statue of Liberty, the Washington, Jefferson, Lincoln, and Crazy Horse Memorials, every single Park of Victory in the former Soviet Union—each of these renderings of history situates past events in the context of a national mythology. Monuments of the kind that require public funds and approval are often the products of extensive bureaucratic machinations that, once built, take up residence as a channel between past and future, funneling one towards the other as part of an existing narrative. Monuments are rarely forces of change, but rather frequently expensive, unwieldy, institutionally sanctioned constructions that function in favor of those in power. So much energy and resources are expended on monuments, of course, because the constructions themselves have the power to shape the future. Monument Lab, an exceptionally ambitious public program that concluded in June, was an attempt to confront and employ this power in Philadelphia. The project included talks, discussion groups, commissioned monument proposals for each of Philadelphia’s original city squares, and one constructed monument prototype by the late artist Terry Adkins installed in City Hall courtyard. Curators Ken Lum, Paul Farber, and A. Will Brown set out to use the category of monument as an actual “lab” to generate ideas about the future of the city, and to conceive of ways to commemorate the past in service to those futures. This rift between founding ideals and present reality is perhaps most starkly apparent in the one monument that the project produced in material form: Terry Adkins’ Prototype Monument for Center Square. 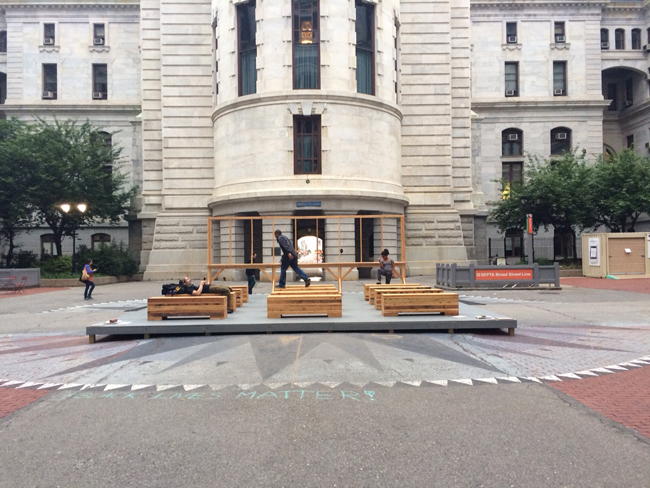 This construction was created based on a proposal Adkins presented to the Monument Lab curators shortly before he passed away unexpectedly last Spring, and was installed in the center of City Hall courtyard for the duration of the Monument Lab programming. A skeletal classroom with sturdy benches built from stacks of recycled wood and an empty chalkboard stand, the work is an almost ghostly evocation of past ambitions for the city. The work itself, meant to manifest the bleak reality of public education in Philadelphia in tension with the founding ideals of the city, exudes an aching sense of loss in what is normally an eerily useless space, but at the same time encourages both reflection and play. At a panel discussion held at the Pennsylvania Academy of the Fine Arts, Lum explained, “[Adkins] saw that City Hall was kind of an urban void. He said ‘it’s a nothing space.’” But, said Lum, “[City Hall] can’t be a space that you go through without thinking about the city,” begging the question: “How do we keep the space from going back to being an urban void?” In its brief period of existence – May 15 through June 7th — Adkins’ sculpture was an actively used structure, often occupied by people talking or napping and children hopping from bench to bench. Prototype showed how much interaction and reflection can be cultivated with a little bit of infrastructure. In a project as multifaceted as Monument Lab, the question of what exactly constitutes a monument is rightfully stretched, morphed, and opened up. However, some specificities of definition are nonetheless important to remember. Monuments are not synonymous with public art, they are not simply large sculptures in public spaces. Monuments are specifically commemorative, and it is precisely this relationship with history that gives them their capacity to shape the future of a given place. Sometimes the impulse to monumentalize events can slow the pace of social change. In the months following the ouster of Hosni Mubarak in February 2011, there was a battle for how recent momentous events would be crystallized in collective memory that ran alongside the continued battle for political power in Cairo. Those girding institutions of Mubarak’s regime that remain in place to this day – the Supreme Council of the Armed Forces (SCAF), and the many attached government bodies – were quick to lay claim on the 18 day uprising that led to Mubarak’s removal and situate it securely in a history of Egyptian exceptionalism. In July 2011, a ballet staged at the state-run Cairo Opera House presented French choreographer Maurice Bejart’s 1990 ode to Egyptian history “Pyramide” with a new ending: the recent uprising. In “The Pyramids and the Revolution” the uprising – having run its course only months before – took its place as another great event in an epic history, allowing those in power to lay claim to the revolution as something to both celebrate and consider finished. In the immediate aftermath of the uprising, Tahrir Square was simultaneously fought over and spoken of as a hallowed site of new historic importance. SCAF sought to neutralize the square by arguing for the necessity to preserve it in the same way that it neutralized the uprising by insisting on its completion. 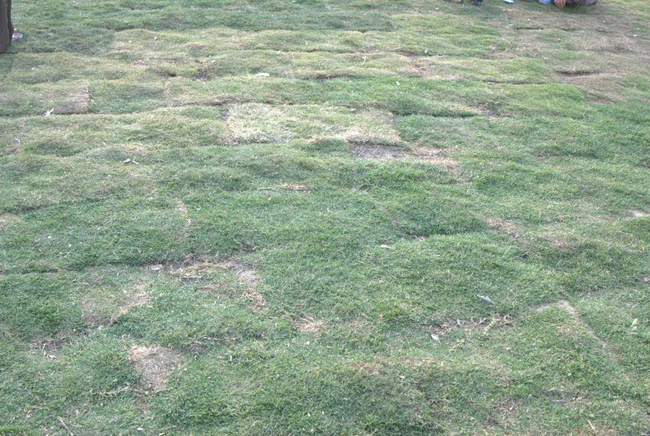 In April 2011, Tahrir was covered in grass and flowers, and guarded day and night by the military – until clashes led to a sustained sit-in opposing military rule. At the same time, there was an active campaign for UNESCO to declare the square a world heritage site. In such a rush to commemorate what had taken place, the impulse itself was laid bare as decidedly regressive, situating an indisputable roadblock in the path toward possible change. The fight for power in Egypt has not yet brought what many imagined and hoped for in 2011, but the 18 day uprising continues to be employed as a kind of chess piece in discursive maneuvers over Egypt’s future. But the collective feeling that they tap into is not hope, and it isn’t anger either. They write, “We are living through a moment of civic ambivalence – a pull between the wounds of the past and the hopeful fixes of the future. Ambivalence is neither apathy nor misdirection. This public feeling hovers at a potential fault line between two Philadelphias.” The divide identified is between the sense of possibility presented by aggressive urban development, and the upheavals that these changes bring. In particular they point out: “With more than twenty-four public schools recently closed, we continue to grapple with the stark fact that our education system operates in strain; and an epidemic of gun violence continues to afflict many across the city.” Monument Lab presents itself as positioned at the center of a fight for the future. This is, of course, where all monuments are situated, as the physical manifestation of a claim on the future. Monument Lab commissioned four artists – WE THE WEEDS, Alexander Rosenberg, Kara Crombie, and Zoe Strauss – to come up with “speculative” monuments for Philadelphia’s four Center City squares, laid out as part of William Penn’s original plan for the city. These artists were offered the opportunity, as Kaitlin Pomerantz of WE THE WEEDS put it in a talk at PAFA, to “think without the burden of feasibility,” to see what a consideration of historical memory can generate without actually building anything. WE THE WEEDS took a different tack, bringing the “motley nature of the city’s visual landscape” into the groomed quarters of Washington Square. Pomerantz described a sense of alienation from this 19th century style promenade, which for her “somehow doesn’t feel like Philadelphia.” She proposed “to re-site architectural features from decaying homes throughout Philadelphia,” in the square. This insertion would open up a subdued, controlled space to environmental contingency and the sense of constant evolution that permeates Philadelphia’s many half-used spaces. Unlike Strauss’ and WE THE WEEDS’ intentionally unwieldy projects, one can imagine both Rosenberg’s and Crombie’s proposals being realized. Rosenberg outlined the possibility of experiencing the full physical history of Rittenhouse Square virtually via cellphone app. The app would overlay the present-day squares with its physical and imagined past. Crombie’s “Sample Philly” would offer an “interactive sculpture in Franklin Square that functions as a programmable drum machine and sampler with a sound bank of musical loops drawn from Philadelphia’s rich musical history.” While Crombie’s and Rosenberg’s proposals access and celebrate particular aspects of Philadelphia’s culture and history, Strauss and WE THE WEEDS seek to reshape our relationships with that history by uncovering rifts and tensions between what’s seen and what’s elided in both historical narratives and urban space. Their plans are unrealizable, but as such offer mechanisms for more fundamentally reimagining the physical city so as to rethink the city’s future. Imagining the Monument to the Third International is an “exercise of wonder” to this day. Strauss and Pomerantz rearrange the city with their proposed monuments, tapping into Philadelphia’s past in a way that refuses celebration and forces engagement. The always-almost nature of these projects can keep thoughts moving through them, as they continue to move through Tatlin’s spiral. One question Monument Lab begs: what happens next? Where will all of this energy go, if not to the construction of an actual monument? In practical terms, this is answered by the documentation of the discourse that took place and its subsequent posting online. This doesn’t feel like quite enough, and of course it isn’t, and it never could be. Of course this project will not fix Philadelphia’s failing schools, and it will not put an end to police brutality or reduce economic inequality or racial injustice. It isn’t meant to do any of those things any more than Tatlin’s monument was meant to secure the self-regeneration of the dictatorship of the proletariat for all eternity. But Monument Lab has spurred quite a few people to think about how they might want that future to look, and how it might be possible to intervene in the city’s landscape and therefore in its mythology as a way to produce that future – which is no small accomplishment. Helen Stuhr-Rommereim is a writer and editor living in Philadelphia. She is a co-founder of Fungiculture Journal, and an editor at Full Stop.